Tuljapur town in Osmanabad district, Maharashtra is renowned for temple dedicated to Goddess Bhavani. Worship of the primeval energy Shakti in the form of the mother Goddess is seen in the four Shakti Peethas of Maharashtra – Tuljapur enshrining Bhavanai, Kolhapur enshrining Mahalakshmi, Mahur enshrining Mahamaya Renuka and Saptashringi enshrining Jagadamba. 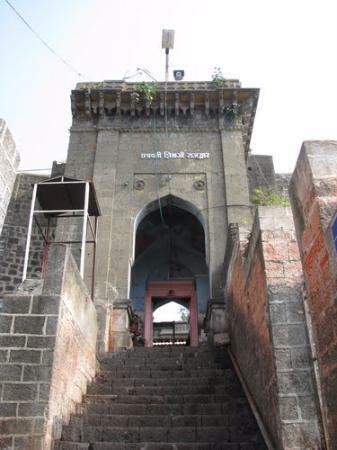 Many legends are associated with the Tuljapur Bhavani temple. One legend involves a demon, Matanga who was wreaking havoc upon the gods and humans. Unable to find any solution, they turned to Lord Brahma for help, and upon his advice turned to Goddess Shakti, who took up the form of a destroyer and powered by the other (Sapta) Mata Varaahi, Brahmi, Vaishnavi, Kaumaari Indraani and Saambhavi, vanquished the demon Matanga and restored peace. Legend also states that Bhavani finished another demon that had taken up the disguise of a buffalo (Mahisha), and took shelter on the Yamunachala Hill which is part of Balaghat mountain range. The Tuljabhawani temple is located on this hill. Another legend mentions the story of a sage known as "Kardam" After his death his wife "Anubuti" had performed a penance at the banks of river "mandakini " for Bhavani mata to look after her infant child. While performing the penance the demon known "Kukur" tried to disturb her penance during which the Goddess came to the aid of "Anubuti" and killed the demon "Kukur". From that day onwards the Goddess Bhavani came to be known as Tulja Bhavani. In this temple, the idol of the Goddess Tulja Bhawani is `swayambhu`(self evolved). Goddess Shri Bhavani is worshipped in the form of a three-foot high granite image, with eight arms holding weapons, bearing the head of the slain demon Mahishasura. Goddess Shri Bhavani is also known as Tulaja, Turaja, Tvarita and Amba. There are two main entrances to get to the main temple. One is called the Raja Shahaji Mahadwar, and the other as Rajmata Jijavu main gate. Going through the Sardar Nimbalkar Pravesh Dwar, there is the Markandeya rishi`s temple in the right. After alighting from the stairs, there is `Gomukh Theerth` on the right side and `Kalakh`, also known as `Kallol Theerth` on the left side. Before the darshan of the Goddess, devotees take a dip here in these theerths. After getting down through the stairs, comes the main Tulja Devi temple. The installation (Sthapana) of the godess is not static but dynamic as compared to other temples. In other temples the idol is fixed or static. But here the idol is not static but it is 'chala' i.e. it can be moved. The installation ceremony of this idol was done by Adi Shankaracharya on Sriyantra in ancient times. By nonstatic or 'Chala' it means that this idol is taken out from SriYantra thrice a year for pradakhina and once the pradaskina or pratikrama is done by the idol along with SriYantra, Mahadeo and Khanderao. A Siddhi Vinayak temple adorns the left side of the main gate, to the right being the Aadishakti, and Aadimata Matangadevi temple respectively. A temple of Goddess Annapurna and Lord Dattatreya is also present in the premises. The important festivals celebrated are Gudi Padva in the month of Chaitra, Shriral Sashti, Lalita Panchami, Makara Sankranti and Rathasaptami. The deity is taken out in procession on Tuesdays. Navaratri is also celebrated with great fanfare. One of the most auspicious festivals, it is celebrated from Ashwin Pratipada (first day of Hindu lunar month) to Ashwin Paurnima (full moon day) which usually falls in the month of September-October. The festival is celebrated to commemorate the event of the Goddess going to her cosmic sleep (Nidra) of five days. On Ashwin Shudh 10, the most important festival Dashera is celebrated. "Simollanghan” (symbolic crossing of boundaries) the most auspicious event of the festival, is performed in the early morning. During this ritual, the Holy Idol of Tuljabhawani is taken out from the Garbh Graha and placed in to the palanquin (Palkhi) which is carried in procession encircling the temple. After this procession, it is believed by the devotees that the deity retires to her sleeping chambers for resting up to Ashwin Pournima (fool moon day). The Deity is believed to wake up from her cosmic sleep of five days on Ashwin Pournima (Full moon day). This being the most important and sacred occasion, nearly one million devotees gather in Tuljapur to witness this sacred event. This 5 days festival is celebrated each year in honour of Goddess Shakambhari in the Poush month according to Hindu lunar calendar (November/ December). This is a sort of mini recreation of the sacred events taking place during the Shardiya Navratra Utsav. During this festival, dramas and music concerts are organized by the Devasthan Trust. This is an important and glittering function in which, the replica of Deity’s holy idol, made of silver is placed on the chariot decorated with colourful sculpts of lions, elephants, horses, bulls, eagles and peacocks, shown as carriers and the procession moves on accompanied by drum beaters and devotees singing traditional devotional songs.